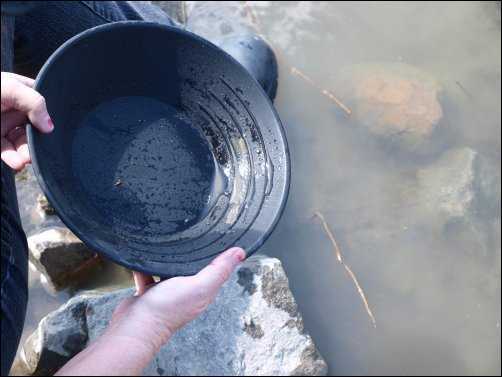 Panning for gold is fun, relaxing, and a great way to strike it rich! Ok, so you may not become rich, but it is fun and makes a great family day. It does not cost to pan for the little yellow flakes and your kids love playing in the water. Adults find a comfort in the focus of the hunt and you can pan at any river, lake, or even from dry land. It is all in knowing where to look and how to find the right stream. 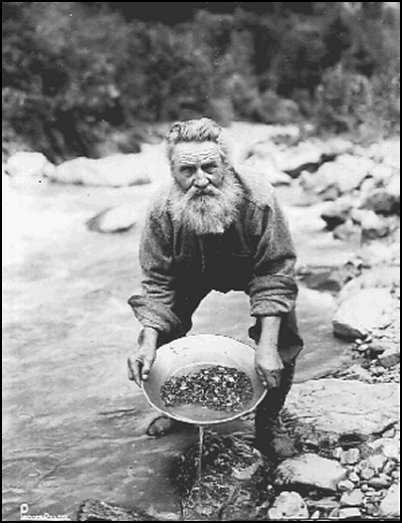 I have been panning for gold since I was a child. Yes, I have found gold in the past and no, I have not become rich. But I love the act of sitting by the river on a warm day and playing in the water. It is just nice to sit there and stick my feet in the water while I pan. If it is a really warm day, just find a good spot and sit in the river while the water moves around you, cooling you and providing comfort for the soul. Anyone can pan for gold and, as of June, 2018, gold was going for about $1,300.00 an ounce. 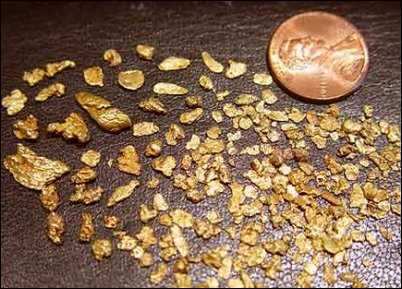 An ounce of gold is about the size of the end of a ladies little finger to the fingernail. It does not sound like much, but when you are picking it out of the water one flake at a time, it can take a while to gather an ounce. Just take your time and enjoy the hunt. If you make a good enough find, it will help you improve your own personal economy and pay off a few bills. 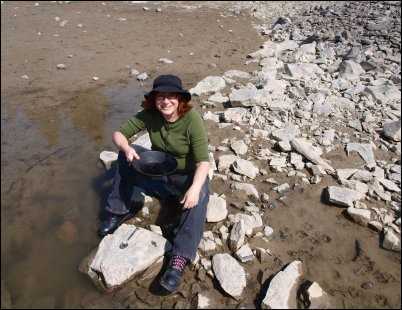 Since I love the outdoors, gold panning is a natural extension of my explorations. But you do not have to be the outdoor type to enjoy panning. You can choose it as a form of entertainment while enjoying the outdoors with family and friends. Everyone is different in their likes and desires and this is just one more way to find free entertainment during the summer when money is tight. There have been gold strikes everywhere in the world throughout history. The U.S. history has had major strikes in California, Nevada, Colorado, Montana, and many other spots. I have panned for gold in all of those states plus Oregon, Washington, Idaho, New Mexico, Arizona, Texas, and even in Germany. It does not matter where you live, just grab your gear, head to the nearest river, and have fun. There are several different choices for equipment if you want to invest as a serious gold seeker, but I like my basic equipment. I am not in it to get rich. I like it for fun and if I can profit something, then I am happy with that, too. 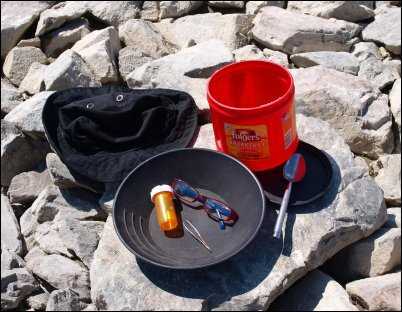 My basic gear is one black, plastic hunting pan ( I finally got something made for looking for gold), an old prescription bottle to put my gold find in (recycled and just cheap), a pair of tweezers to pick up the gold, a pair of reading glasses so I can see the gold, a hat to prevent the part in my red hair from getting sunburned, an empty coffee can, and an old spoon. Coffee can and spoon? Yes. When I have had a full day of panning and it is time to go home, I fill it with sand from a section of the river I want to continue to explore. During a warm evening on the patio I can pan out the dirt I brought home in comfort while enjoying a great barbeque with my husband. There is always a way to enjoy it away from the water, too. You can apply this same technique at dry river washes and riverbeds. Anything can be used to hunt for the gold. You can use a jar, dish, saucer, lid from the coffee can, and anything else you can wash the dirt over the edge while the gold flakes settle to the bottom. I use the standard black pan and have for years. I am used to it. But if you are going to make an investment in a real pan for hunting gold, the green one best, because it is easier to see the gold. Do not invest in higher priced gold hunting equipment until you are sure you are going to be a serious hunter in it for the money. Rivers and streams are my preference for panning. When you find a river or stream you want to pan in, there are a few things to look for in a choice spot. The inside bend of a river or stream is where the gold will wash with the slow movement of the water and will settle into the ground. 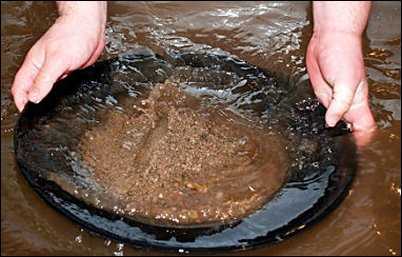 Gold is heavier than the water and dirt, so when you find the spot you want to pan you need to dig down a few inches or more and gently lift the dirt or sand into your pan. Do not use quick movements or you could wash away possible flakes before they reach your pan. Once you have the sand or dirt in your pan, just move it from side to side or in a circle to stir up the dirt and wash it over the edge. This is to be done gently so you do not slosh everything out of the pan, but firm enough to mix the dirt or sand and wash it over the side of the pan. Yes, you can tip the pan enough to spill the water out along with the dirt. The gold will settle to the bottom, so when you are just about out of dirt and sand, watch carefully for your gold flakes. If you do not see any flakes, then try it again with another pan of sand and dirt. Pick out the rocks from your pan that are in the way and if you are in a park area of the river, watch out for goose poop. This probably goes without saying, but do not eat anything from the pan and never drink the water from the edge of the river. Carry your own in a plastic bottle. Try to avoid anything glass. It can break when dropped and you are taking a chance of getting cut. Now you need to learn the difference between real gold and fool’s gold. They are both beautiful to look at and if you are not sure, just add it to your collection. The assayer will let you know if it is not real. There is a simple, streamside test. 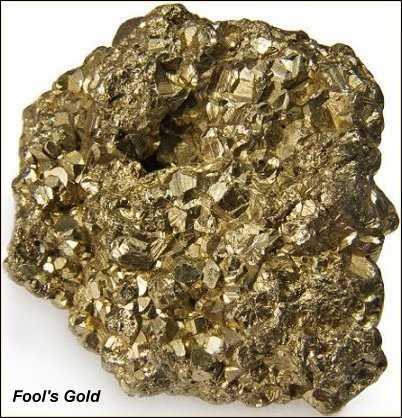 Fool’s gold will shatter like dreams of getting rich, real gold is soft and will mash flat. The real stuff does not shatter and disappoint. There are a lot of pros and cons to hunting for gold. The cons are the water can be very cold, your hands will ache, your feet will cramp, you can fall in the water, you may never find a single flake, you may find only one flake, you have to deal with wild animals early in the morning and early evening, you can get your hopes too high, the sun is hot and you will burn, it is a long drive to the nearest river, your family will complain, there are bugs, and many more reasons to avoid this hobby. The pros are the water is cold on a hot day, your hands and feet feel great, you can fall in the water and be completely cool on a hot day as well as provide entertainment to the delight of your family, you may find more than a flake in your lifetime, you will see nature in all it’s glory as you run away from it, it is a long, relaxing drive, your family will love it or at least love being in the water, you can buy bug spray, and it is a great hobby for everyone of any age. I recently went panning at one of the nearby rivers. It felt good to sit in the warm sun and pan at the water’s edge. My husband was entertained by taking pictures of me and the surrounding area for his portfolio while I was panning. I was glad I went and enjoy every moment while it lasted. But when we were ready to move on, the rock I was sitting on tipped and I almost hit the water. He caught me just in time. But I almost hurt myself from laughing, so it was a good day. The very next day it snowed! 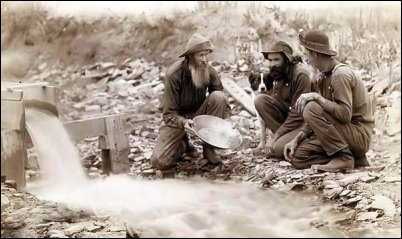 This is the perfect season to begin a gold panning hobby. The rivers are flowing and if there is gold to be found it is washing from the higher elevations into the lower streams and rivers. You can find equipment at local outdoor stores or check for a local gold hunters group near you for information. They can provide you with all you need to know on how to pan, where to go locally, and where to sell your gold. It is fun to belong to a group of people that love the hobby. Have fun and if you fall in the water, just climb out and have a good laugh.